Next Best Junior Chef is the new trilogy written by Charise Mericle Harper and illustrated by Aurélie Blard-Quintard. While there are a few chapter books and middle grade novels that come each year with cooking and baking as important plot points, this trilogy stands out for so many great reasons. I am a huge fan of books about food, cooking shows and competition cooking shows. I have watched every reality food show on Netflix and Hulu (although I draw the line at cupcake competition shows, even if my favorite fictional television show foodie, Dev Shah, hosts the equally fictional Clash of the Cupcakes) and have even been known to turn on the Great British Baking Show in my library before school and at recess. Reading Lights, Camera, Cook!, I almost felt like Harper wrote this book just for me. Now I can talk to my students as enthusiastically about a foodie book as I do about foodie television shows. 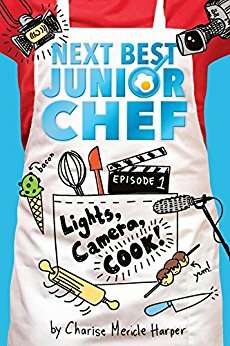 And, having watched so many shows (including Master Chef Junior and Chopped Junior) I have noticed and had wonderings about the behind the scenes workings and, whether true of not, I feel like the Next Best Junior Chef series is giving me that longed for behind-the-scenes peek into these shows. 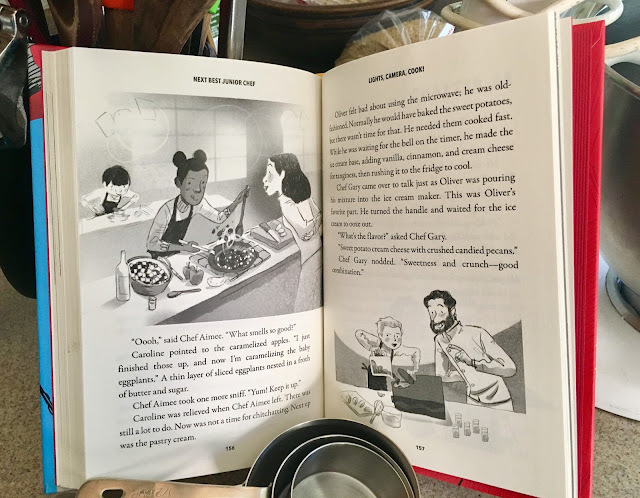 Harper has created a world in which a kid's cooking competition is suspenseful and exciting, but also inclusive, educational, supportive and joyful. Lights, Camera, Cook!, Episode 1 in the trilogy, starts of on the set of the kid's competition show with the cameras rolling. First, we meet the judges, who seem to have similarities to a few celebrichefs (Alice Waters? Christina Tosi? Anthony Bourdain?) The prize for winning Next Best Junior Chef is a "food truck specially designed for the winner and a guest spot on Adventures in Cooking," Chef Gary's show, which will be filming in Italy. In addition to the three judges, Harper adds in a character I especially like, Chef Nancy Patel, the mentor chef. I love the idea of an adult on set working with and educating the young contestants! And, the contestants in Lights, Camera, Cook! educate the readers! Breaks in the text feature first person narrative from the characters talking about how they learned certain skills (YouTube tutorials!) as well as cooking terms and recipe ideas. Harper also includes instructional backmatter that, in this first book, shows, "Essential Knife Techniques for the Young Chef." 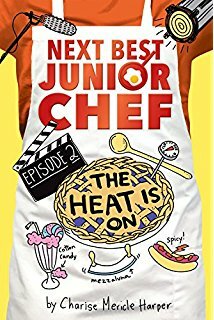 Two boys and two girls make up the cheftestants for the Next Best Junior Chef, and again, I just have to think that Harper has watched more hours of cooking competitions than I have because she "gets" the types that usually show up. Twelve-year-old Oliver is the wise-child, mini-adult contestant who says things like, "Being a chef is a journey, not a destination. I want my food to reflect my journey of discovery and excitement, but in a quiet, thoughtful way." Tate, the other boy contestant, is the youngest at nine and a ball of energy. Eleven-year-old Caroline, the daughter of a chef who owns a French bistro, says she speaks, "French, English and food." Then there is Rae who lives in a trailer park and learned to cook after watching cooking shows with her grandmother and being inspired by her neighbors, who come from many different cultures and share their recipes with her. 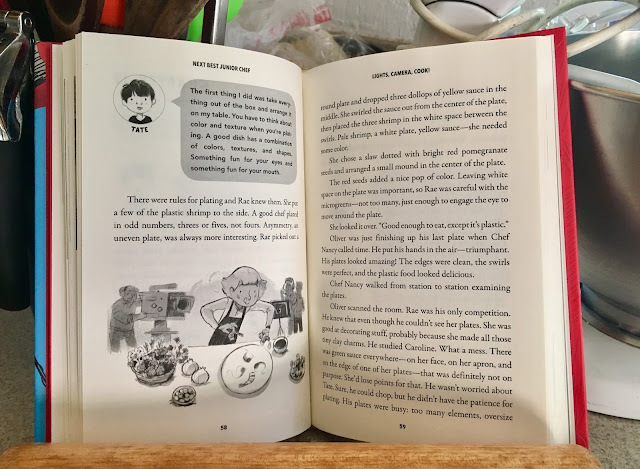 As a character, Rae interests me because it's rare to find a kid's book with children from different socioeconomic classes as characters where this detail is just a thread in the storyline and not a big plot point. And, while Harper only makes one subtle reference to Rae's status in the story (Rae has never used a food processor before and asks for help learning how to use this expensive piece of equipment) I value the way that she does this. 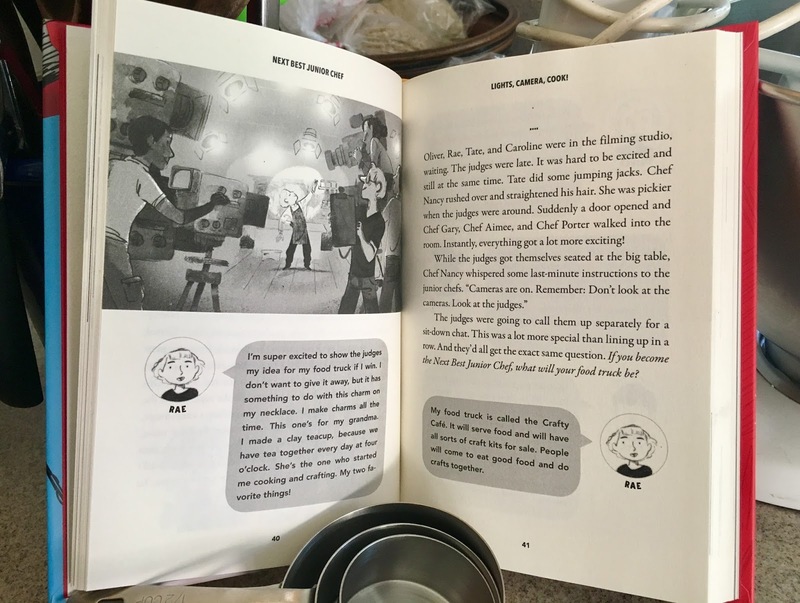 There are so many other little details that delighted me as I read Lights, Camera, Cook! I could go on and on. And, while one contestant is eliminated at the end of each book, Harper also captures the kindness of children. If you don't watch reality cooking competitions, it is markedly noticeable how much kinder, empathetic and supportive the child chefs as as opposed to the adult. One reason I love the Great British Baking Show above all other shows is the kindness of the judges and contestants toward each other as well as the levelheaded (and admittedly less dramatic) approach to the competition itself. I especially liked the scene before the final competition in which the mentor chef opts not to give her usual speech to the cheftestants and instead invites them to each share a wish with the group. In a lovely, compassionate moment, the children wish each other calmness, planning, creativity and steadiness. Harper imbues this warm, caring spirit into her book, making it feel all the more authentic and worth recommending!